A professional PDF Converter, PDF Writer, PDF Creator, PDF Editor, HTML Converter, Postscript Converter, AutoCAD DWG Converter, PCL Converter, etc. PDF Password Remover can be used to decrypt password protected Adobe Acrobat PDF files, which have "owner" password set to prevent PDF from editing (changing), printing, selecting text and graphics. Decryption is being done instantly. The decrypted files can be opened by any PDF viewer (e.g. Adobe Acrobat Reader) without any restrictions. PDF Password Remover doesn't associate with Adobe Acrobat or any other third party's program. User Password: It is also called “open password”, which was defined by the people who create the PDF file for protecting PDF files from opening by others without the author permission. If a PDF file is protected by the user password, only the people who enter the password can open the PDF file. Owner Password: It is set to protect PDF files from changing by others without permission. With an owner password, the owner can protect the PDF files from printing, copying or editing. If PDF file is protected by only owner password, you can read it but maybe you cannot edit or print it. When Need VeryDOC PDF Password Remover? When you need to remove the open password from PDF file, you can open it without inputting password. When you need to unlock PDF documents that restrict you of printing, editing or copying of data in batch. When you need to do unattended conversion, this software can also be used as command line software. When you need to copy text or images from the password-protected PDF file. Remove the security settings from encrypted PDF instantly. Support PDF 1.6 protocol (formerly only supported by Acrobat 7.0 application). Decrypt protected Adobe Acrobat PDF files, removing restrictions on printing, editing, and copying. Support PDF 1.0-1.7 format, including 40-bit RC4, 128-bit RC4, 128-bit AES decryption, compressed files and unencrypted metadata. How to remove PDF master passwords in batches? Why can some PDF passwords not be removed? 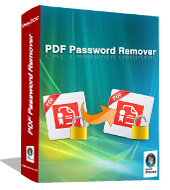 Can VeryDOC PDF Password Remover remove open password?